Today is the halfway point in the 31 Days of Picture Books Series. I think it’s high time to share my absolute most favorite picture books from my early memories. 1. 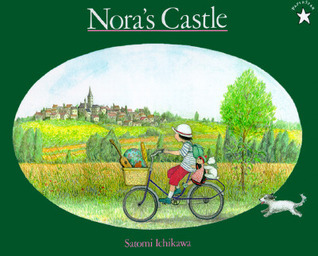 Nora’s Castle — Satomi Ichikawa — I always dreamed of finding my own castle, and this book fueled my imagination. 2. Keep the Lights Burning, Abby — Peter Roop — I wanted to be a heroine like Abby! 3. Bread and Jam for Frances — Lillian Hoban — Even as a little child, when I was supposed to be relating to Frances as a peer, I thought she was so cute. 4. The Twelve Dancing Princesses — I can’t find my childhood version anywhere! But I oohed and ahhed and declared “that one’s mine” over the Princess’s dresses every time I read it. 5. 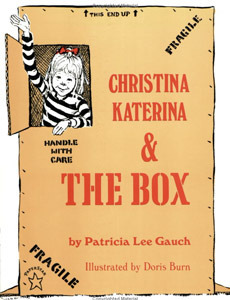 Christina Katerina and the Box — Patricia Lee Gauch — Give your kids a big box and childhood ecstasy is born. This is a genre I love and I am finding (and remembering!) favorites all the time with my children, but those five are the ones I remember loving most as a little girl. Each of them had something that captured my imagination or inspired me in some way. Even Frances inspired me, because I wanted to be able to make up little ditties like her. I’d love to know which books you still treasure from your childhood. Blueberries for Sal is another favorite. I could study all the details in the illustrations forever! That one was from my children’s childhood — don’t think I read it as a child myself. The picture books I remember most as a child were Little Golden Books. Besides Five Pennies to Spend, I loved Georgie Finds a Grandpa, Five Little Firemen, When You Were a Baby, The Magic Wagon, and I Decided. I have my original (now battered after my three sibs and I and my kids and grandkids) copies of all those. Priceless! Thanks for mentioning your favorites! Most are new to me, but I will check them out for my youngest granddaughter! Bread and Jam for Frances is also one of my very favorites, though I love all the Frances books. “What I am is tired of jam”! Love it! I’d love to know what your other favorites are!